I've done a couple things around the layout in the last month. Yup, The catenary that took me a couple weeks to build up is all gone from the layout again. 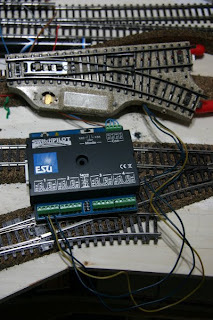 I initially installed it because I wanted the pantographs of my electrics to be guided nicely through the long tunnels on the way to and within staging. There are several tight spots where I felt I need to push the pantographs down to make it through the opening. Turns out that a fully extended pantograph is about as high as the catenary masts. I also realized (and anyone who did this kind of thing before would tell me), that it's a *really* bad idea to have catenary wires in the already tight staging space under Talheim station. They just get horribly in the way whenever one tries to access a derailed train down there. Instead I will let the engines run with the pantographs fully extended inside the tunnels and provide "catch" devices to gracefully lower the pantographs to normal catenary height at tunnel portals and in the one or two tight spots where I really don't have enough clearance (notably below the street tunnel at Talheim station. With open frame construction and various ramps connecting the various levels, there is always potential that a derailed engine or cars runs off the track and falls all the way down to the floor. Model meets laminate flooring... Usually not a pretty sight once the model lands. I installed protection/guide railings around staging, the ramps, and some curves to protect derailed trains. 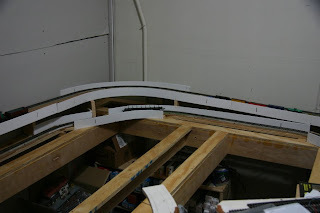 I glued down more track in Talheim, and am getting ready to install the occupancy detectors. 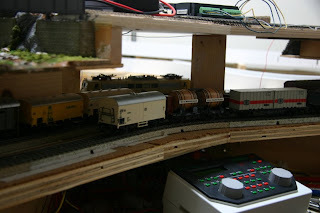 Contrary to staging, which uses current draw sensors, on the rest of the layout I'm using simpler detectors that can detect when wheelsets are in an insulated section of a rail. This will require cutting gaps in the rails and soldering quite a few detection leads. Fun. I'm using the trackage in Talheim to test out the approach, before I do this elsewhere. It looks like my Switchpilots are the first revision and are a bit unstable. They occasionally forget their address, don't turn off voltage to the switch, and/or don't follow their programming. I'm unimpressed. I contacted ESU Support, but haven't heard back yet. Finally, I fixed a few minor things and relocated a cross-over switch on the ramp from staging that caused several derailments. das kleine Filmchen mit der Eisenbahn in Aktion, sehr sehr nett.